Situated in the cool mountains of Bali, Ubud is a royal cultural center ideal for a relaxed and memorable vacation. At the Ubud Village Hotel, spend your days at poolside or explore lush forests and scenic valleys nearby. Indulge yourself at our fine restaurant with savory Western and Indonesian delicacies. See skilled artisans at work creating exquisite paintings and carving. Experience the simple pleasure of Ubud life at one of Bali's most important artistic landmarks, set into the natural beauty of two river valleys where centuries ago the holy man Rçi Markandya was inspired to complete the building of the Mother Temple, Besakih. 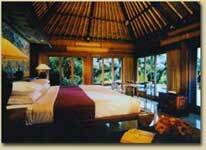 Accommodations: Pande Permai Bungalows is a hidden treasure deep in the Ubud area of Bali. Consisting of 54 rooms, each room with unique views of one of the River tributaries and ricefield, a stay in this exclusive retreat can be relaxing and spiritual at the same time. 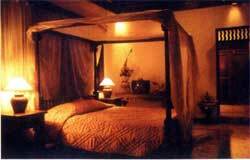 At night the soothing sounds of nature serenade you to sleep, in comfortable. 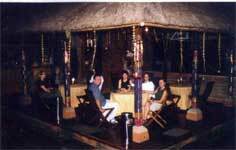 Pande Permai Bungalows was erected in 1989 and was renovated in 2000, this resort resort has an air of comfort and privacy not found at other properties with 32 Standard rooms, 12 Superior rooms, 8 Suited rooms and 2 Deluxe rooms. all ooms are completed with AC or Fan, mini bar, TV, Hot and cold running water, bathtub, bathroom shower. Your home away from home offers 180-degree views of the stunning valleys and rice fields that make choosing Ubud an easy decision. The restaurant overlooking it's disappearing pool and onto the River boasts a range of cuisine that will be long remembered. For your relaxation, there are swimming pool for children and adult which are surrounded by a lush tropical garden which make you relax and enjoyable. Our restaurant, which is next to the pool and overlooking our tropical landscape, is open until 10 P.M., serving Indonesian as well as International cuisine. Room service is available round the clock. Laundry service, large parking area, Doctor service on call, Safe deposit boxes. Just 10 minutes walk from the cultural of Ubud Village (Ubud Palace), 150 meters from Ubud monkey forest and 45 minuts from Bali international Airport. 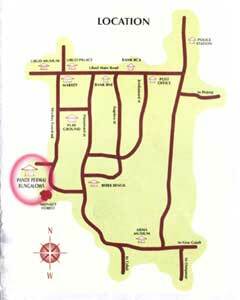 Pande Permai Bungalows is the perfect base point to explore the culture and attractions of the mountain region. Rice Field walks leave. 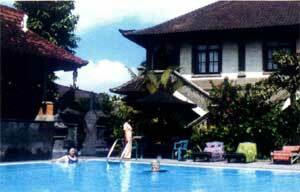 This hotel located only 100 mtrs from the monkey forest, 200 mtrs from Big Hindu temple and holy spring water basin. This hotel managed by family so that more comfortable and familier. You come from far a way and you will stay with Bali family so that you can see and touch their culture and traditional life directly. Charge : nett quoted in US Dollars.